Clogged Gutters – This is the most common gutter problem there is. Many homeowners tend to neglect their gutters simply because what’s in them is not visible from the ground. Clogged gutters tend to overflow instead of routing rainwater to the right areas. A preventive approach is the most effective and practical solution. Inspecting and cleaning the gutters twice a year can help ensure you have free-flowing gutters all year. Consider investing in gutter protection systems if regular inspections are not an option. Sagging Gutters – Another consequence of neglected gutters is that the combined weight of leaves, debris and standing water – along with loose or missing gutter hangers – can pull sections of the gutters towards the ground. The holes left by the nails may need to be drilled and filled in before new hangers can be installed. If you’re not confident doing this, have it done by a gutter professional. Leaky Gutters – Leaks can happen if there are worn-out gutter joints or holes caused by corrosion. If not addressed soon, rainwater can get onto your siding and landscaping, or around the foundations. Regular inspections and maintenance can, again, help prevent leaks. You should also consider investing in a seamless gutter system to eliminate the need for re-sealing the seams. Improperly Pitched Gutters – Gutters are not perfectly horizontal, but are pitched towards the downspouts. If you notice standing water in the gutters, it means your gutters are improperly pitched and will need to have the pitches corrected by a professional. Downspouts Draining Too Close to Foundations – Downspouts should have their termination points several feet away from the house. Otherwise, the water would collect at the foundations or seep into the basement. There are off-the-shelf gutter extensions that are easy to install. If your gutters are up for replacement, a gutter professional like us can address this issue. 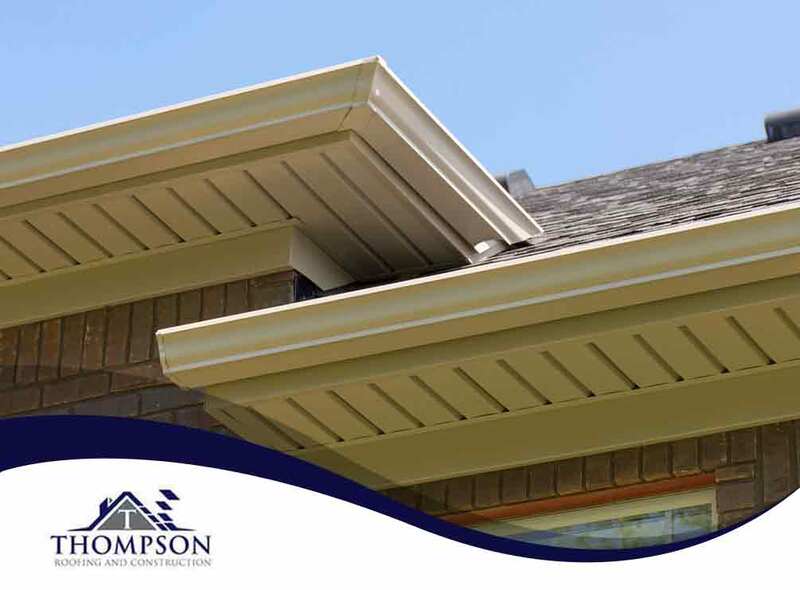 To learn more about our roofing, gutters and new construction services, call Thompson Roofing and Construction today at (256) 251-5566. You can also fill out our contact form to schedule a free roof inspection. We are located in Madison, AL, and serve surrounding areas, including Huntsville.